Last year’s pumpkin harvest was truly out-o-control! I harvested so many pumpkins! I shared several of them with family & friends but still ended up with mountains of my own. I love to use these heirloom pumpkins for puree in my Pumpkin Granola so I cooked ’em up & pureed them. They were measured out into 2-cup measurements and frozen for future use. But RancherMan was the wild-hog-hunting KING and our freezer was filled to capacity with wild pork. But I still had two remaining pumpkins… They had some staying power, still looking as fresh as the day I harvested them. But I really needed to do something with them before they started to deteriorate. But with no freezer room, what will I do? I decided to Dehydrate the Pumpkins. This entry was posted in Blog Posts and tagged Cooking, Dehydrating, Food Preservation on September 13, 2018 by Texas Homesteader. Last year’s garden included a very robust pumpkin harvest! When the season was over I harvested all those pumpkins and brought them inside before the first frost. But there were just so many! I gave several fresh pumpkins to family & friends and used the remaining pumpkins for fall decoration purposes. One by one I cooked & pureed the pumpkins, using them in my Pumpkin Granola or other dishes. But here we are months later and I’m staring at those two remaining pumpkins. And RancherMan’s filled our freezer with so much wild pork there’s no room to spare there. But when that pumpkin starts with planting the seed, you make sure none is wasted! I decided to cook & dehydrate the two remaining pumpkins & store ’em in my pantry instead. It’s so easy to do, y’all. 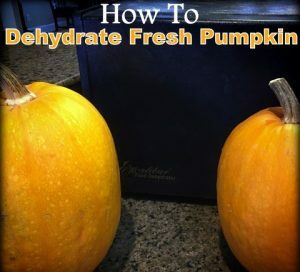 And unlike using the freezer, dehydrated pumpkin uses no additional energy to store. Come see what I did! 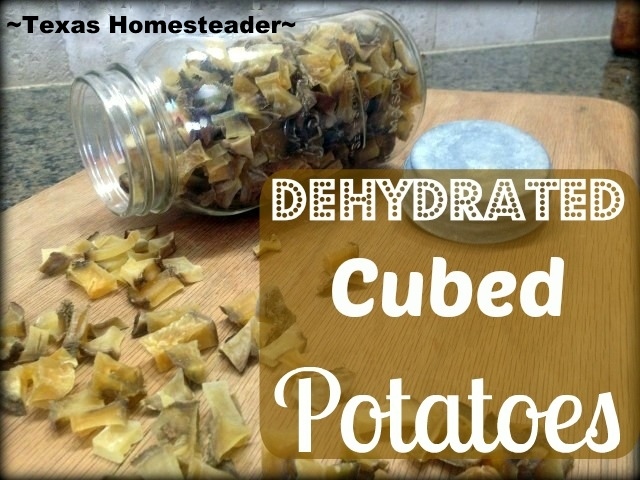 This entry was posted in Blog Posts and tagged Cooking, Dehydrating, Food Preservation on March 4, 2018 by Texas Homesteader. Food waste – we all hate it. We work diligently to make sure none of that food we’ve paid our hard-earned money for is wasted. But are we doing all we can? Maybe… But maybe not! Have you ever thought about eating your compost? Stay with me now, I’m not suggesting that you root through the compost heap and snack on its contents. Today I’m talking about food destined for the compost heap. This entry was posted in Blog Posts and tagged Cooking, Dehydrating, Environment, Food Preservation, Frugality, Gardening on February 11, 2018 by Texas Homesteader. Every year my aunt shares with us the abundance from her very productive apple tree. She always goes through quite a bit of trouble to make sure I have all the apples I can possibly tote back home! But in the end RancherMan & I hauled back all we could fit into our small car. 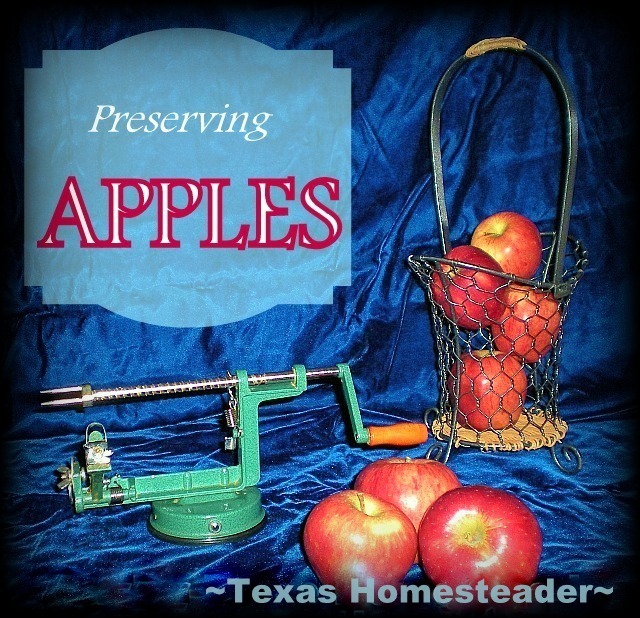 I’ll not let any of them go to waste – I set out to preserve all those beautiful apples! It was a lot of work but after some time in the kitchen preserving them we have plenty of apple deliciousness in the pantry. Want to see some of the things I was able to do with them? This entry was posted in Blog Posts and tagged Cooking, Dehydrating, Fall, Make-It-Yourself, Recipes on November 5, 2017 by Texas Homesteader. Remember recently I ended up with a boatload of fresh carrots? Now there was no way to consume that many carrots before they went bad. So I was frantically sharing as many as I could with friends, family & neighbors but there were Still. So. Many. Carrots. So I dehydrated a huge bunch of them so I could enjoy them all winter long in our hot soups & stews. 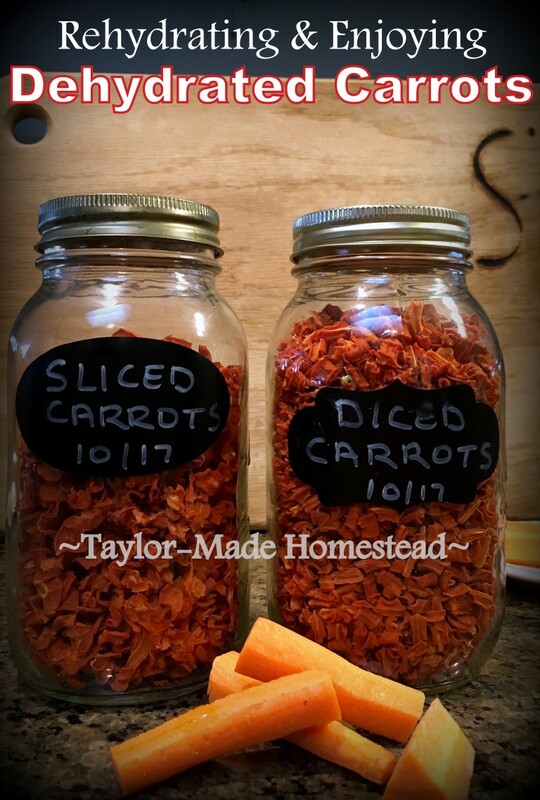 (you can read about dehydrating carrots here) These dehydrated carrots look awesome in my pantry in shining glass jars. And they take no additional energy to store such as a refrigerator or freezer. But I wanted to know how they would taste if I reconstituted them to enjoy as a veggie side dish. Let’s check it out, shall we? 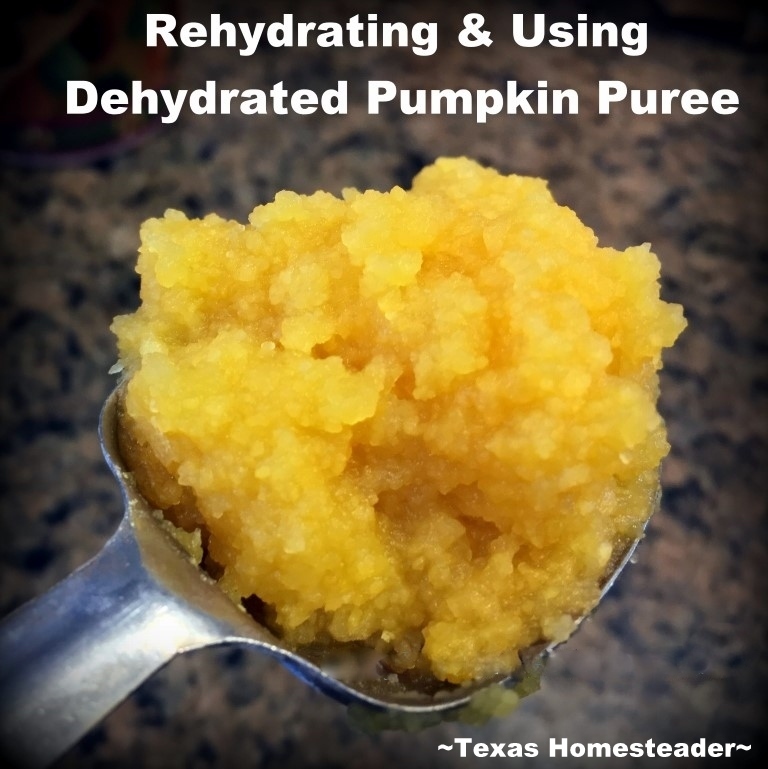 This entry was posted in Blog Posts and tagged Cooking, Dehydrating, Frugality, Recipes on October 27, 2017 by Texas Homesteader. Apples, apples everywhere! My aunt shared ten whopping bushels with us this year! As I mentioned a couple of weeks ago, there were many delicious things we did to preserve the apples but I tried something new this year: Fruit Roll-Ups! I made the fruit leather using nothing but homemade unsweetened applesauce. There was no need to add sweetener, the apples were sweet enough all by themselves! And then I made another batch where I stirred in about a tablespoon of cinnamon & made apple/cinnamon roll-ups. It couldn’t have been easier! 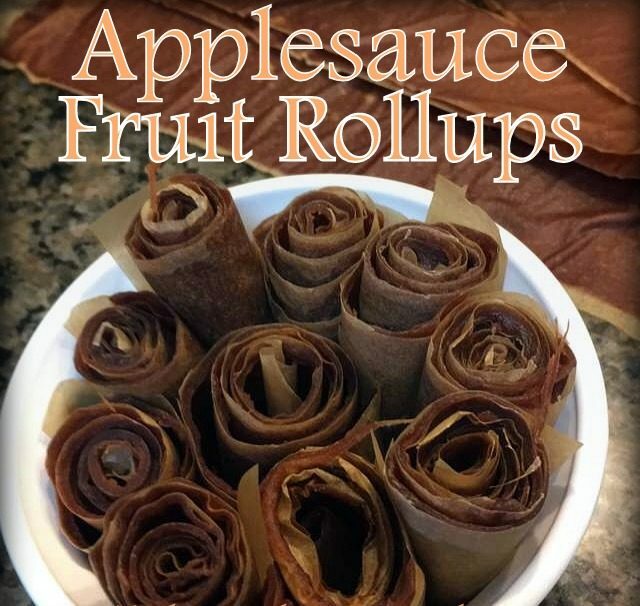 I share many of the ways I preserved these fresh apples at the bottom of the post, but for now let’s check out these fruit roll ups! This entry was posted in Blog Posts and tagged Cooking, Dehydrating, Fall, Frugality, Gardening, Make-It-Yourself on October 22, 2017 by Texas Homesteader. I was given a boatload of fresh carrots recently and I didn’t want them to go to waste. Now I’ve written before about turning ugly carrots into beautiful carrots by chopping ugly carrots into uniform pieces. But these carrots were already beautiful and there were WAY too many for us to eat fresh. And I didn’t want to waste any of them so I decided to dehydrate them. In past carrot dehydrating I’d steamed the carrots instead of blanching them. Then I dehydrated them using my small household-sized dehydrator. But now I have a 9-tray Excalibur dehydrator. I can really do some damage to that mountain of carrots now! Come see what I did. This entry was posted in Blog Posts and tagged Cooking, Dehydrating, Frugality, Gardening on October 8, 2017 by Texas Homesteader. I love fresh spinach & I’m sure to plant it every year in my edible landscape garden. It’s beautiful, leafy-green and makes a lovely border. Oh, and you can EAT it! What’s not to love??! But in our part of NE Texas the window of opportunity in enjoying fresh spinach is short. In no time our spinach bolts and becomes bitter. But I’ve recently been introduced to a completely different kind of spinach. One that grows vigorously in a vine. In the heat! Malabar spinach! This entry was posted in Blog Posts and tagged Cooking, Dehydrating, Food Preservation, Frugality, Gardening on November 13, 2016 by Texas Homesteader. Dehydrating Fresh Spinach To Enjoy All Year Long! I love fresh spinach, and I love that during early spring it produces so prolifically. We like to eat as much spinach as we can while it’s fresh and crisp but I also want to preserve that delicious, healthy spinach to enjoy later in the season – way after the plants have bolted and are gone. 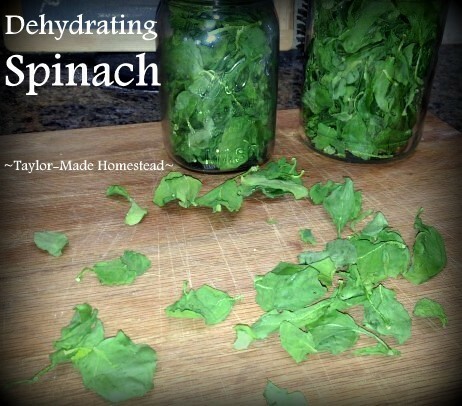 I experimented with dehydrating fresh spinach this year and I loved the results. I wrote this piece for one of my favorite publications, Mother Earth News. C’mon y’all – check it out! This entry was posted in Blog Posts and tagged Dehydrating, Environment, Food Preservation, Gardening, Spring on June 17, 2016 by Texas Homesteader. D’ya ever eyeball that big honkin’ bag of potatoes, compare the price to that small overly-expensive bag of potatoes and have a hard time making the economics make sense? Me too!! As empty nesters there are only 2 of us here at the Taylor Household these days, but dang it just doesn’t make sense to pay more per pound for a small bag of potatoes. So I’ve been buying that big bag & dehydrating the excess potatoes for pantry storage. I’ve shredded them for dehydrated hash browns and we love them this way, but now I want to cube them up like I’d use in a stew and although there’s one simple important thing you must do before successfully dehydrating them – it’s super easy to do! I recently wrote about it for Mother Earth News, check it out. 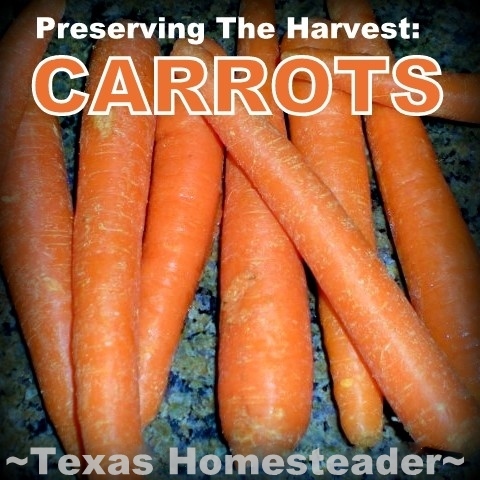 This entry was posted in Blog Posts and tagged Cooking, Dehydrating, Food Preservation, Gardening on April 1, 2016 by Texas Homesteader.